Yes. This stuff. Wilton Cake Release. I have the Nordicware Daisy pan (more nooks and crannies than you can shake a stick at) and it’s the only thing that works. I have been so curious about this cake. Thanks for making it! I use Baker’s Joy Baking Spray and my bundt cakes pop right out. Let the cake cool in the pan first. Yes! I just put it on my Amazon Wish List! It is an awfully sweet cake. I wish they still made the frosting mix so that the original could be compared to the update.Thanks for posting about how it turned out for you (as well as for the link)! I’m going to keep my eyes out for some sort of powdered-frosting equivalent. My friends and roommates have like this cake a lot, but it’s just a little..tooo sweet for me. Try a large canister of powdered breakfast drink or hot cocoa mix (main ingredients should be cocoa powder, sugar, and powdered and/or nonfat dry milk). I have tried this method a couple of times and it seems to work pretty well – you get more of a soft fudgy tunnel that stays soft/fudgy/puddinglike both at room temperature and after refrigerating (tastes good out of the oven so it might not last long enough to find that out). There are also very good recipes that use chocolate instead of cocoa but that would add the step of having to melt it and using the chocolate may make the tunnel solidify when it cools and you would have to warm it to get the same effect (although warm chocolate is not a bad thing … if you really want that extra heavy dose of chocolate, just buy some truffles or chocolate chips and throw them in there …). of the cake and the amount it rises may be different. This would also let you not have to use granulated white sugar in the cake portion of a recipe and confectioners’ sugar for the filling/tunnel portion of the cake. I have also found that the butter needs to be REALLY REALLY VERY VERY soft (DO NOT melt it) – this makes it easier to mix the ingredients by hand. You could also try using Nesquik chocolate drink powder, which also comes in canisters, but you may have to add some powdered milk. Ditto for Nesquik strawberry powder except that you will get a strawberry cake with a strawberry tunnel. 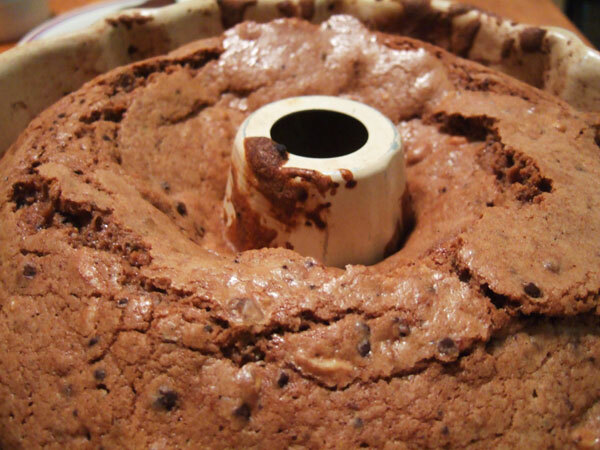 I have not tried this but have seen similar variations for the tunnel cake using both from scratch recipes and cake mixes, both with pudding mixes and/or cream cheese – both of these methods would let you have tunnel cakes of flavors other than chocolate and/or cakes of one flavor with a tunnel of a different flavor. Trader Joe’s sells a DRY Chocolate Frosting Mix. 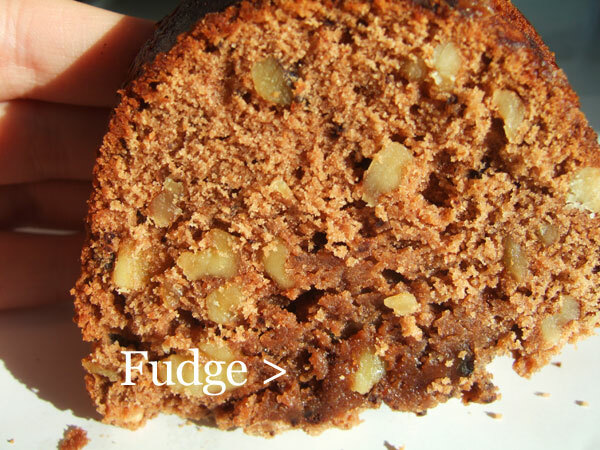 USE JIFFY BRAND FUDGE FROSTING MIX IN THE BOX. USE TWO BOXES TO MAKEUP FOR THE TWO LAYER PHILLSBURY FROSTING THAT IS NO LONGER AVAILABLE. Jiffy has discontinued dry frosting mixes. I’ve done coffee cakes in bundt pans for years and they are a bit tricky. The secret is to grease and then flour. I find the best way to make sure you get every surface is to forego the spray and to rub butter or Crisco on with a paper towel. That way you get all of the little crevices. Then roll around a little flour till it’s all coated (this also lets you see any spots you missed) before putting the batter in the pan. Once your cake is done, let it sit in the pan for about 5 minutes, run a little knife or spatula down into the curves to make sure everything’s nice and separated (it should be if you greased and floured well), then invert. The extra time also allows the steam from the hot cake to help make sure it’s good and separated. You might also try leaving the cake in the pan longer than the 5 minutes stated above – I tried 30 minutes and it was okay but could have used even a little longer. The original recipe calls for leaving the cake in the pan for up to 2 hours but I don’t know if it really needs that much. Hm, interesting. Thank for the link! Wow, this took me back to my college years! My sophomore year, 1967, my physics professor invited a bunch of us students to dinner at his home, and his wife baked a tunnel of fudge cake. we were totally impressed! It was the most delicious tasting, and “coolest” looking thing we’d ever seen. Now, I admit that we were weary of the campus dining room food, where “mystery meat” was often the fare, but we thought it was very special to be invited to dine with our professors. And before you cynics out there get weird, this was a very fine women’s college, and nothing creepy was going on. It was a huge honor to be invited to dinner with a professor’s family, and we always were in groups. Ahhh, loved the original Tunnel of Fudge cake. It was the forerunner of the chocolate lava cake, and clearly one of the most innovative things to eat at the time. Thanks for the memories. Love your blog! I make this every year for my daughters birthday. You can still find the powdered frosting mix if your part of the country sell “Jiffy” products. They are best known for their Jiffy corn muffin mix. They also sell single layer cake mixes and single layer dry frosting mixes. You will need to buy two pkgs. and I add a bit more cocoa as I like the cake to be very chocolatey. Trader Joe’s and Wegman’s now carry a chocolate frosting mix and if you add 1/2-2/3 Cup Cocoa powder, you can make the ORIGiNAL and BEST Tunnel of Fudge Cake! awesome! I will have to try it! I have been trying to remember how we made this Tunnel of Fudge cake for a long time, so I am extremely happy to see this recipe! I was so excited to see your blog about this memory-making cak!. I have been a follower of the Pillsbury Bake-Off since I was 10 years old–over 50 years ago. I remember when this iconic recipe was published and had made it way back when. It was great and so unique! Kudos to Ella Helfrich who created the recipe and entered it in the bake-off!! I was so disappointed when the frosting mix was discontinued and am delighted to know of the ingenuity of the substitution to get that fudgey chocolate tunnel inside this cake.